Miercom executed comprehensive hands-on testing and evaluated the performance of some widely deployed features that are critical for reliable functioning of enterprise networks. The test methodology focused on specific areas in which Cisco believed there were key competitive differentiators between the products. Test results validated include throughput, latency, energy efficiency, stacking, LACP load balancing and Quality of Services (QoS) performance. 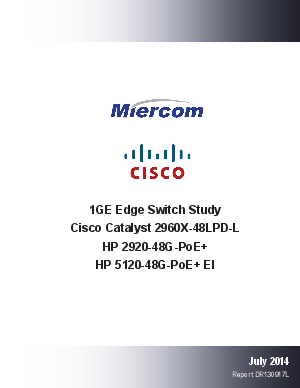 Miercom found that the Cisco Catalyst 2960-X demonstrated superior performances against the competitive switches in the tests featured in this report. We tested the following switch-configurations of the Cisco Catalyst 2960-X, HP 2920 and HP 5120 product families.